June 27, 2008, t?? 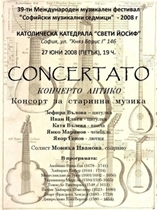 7.00 PM, the St. Joseph Catholic Cathedral in Plovdiv is going to host a concert of the world-famous " Concerto Antico" Group for Ancient Music. The concert is taking place within the 39th International Music Festival "Sofia Musical Weeks", and features the participation of Monica Ivanova - baroque soprano; Zefira Valkova and Ivan Iliev - violins; Katia Valeva - viola; Yavor Genov - cittern; Yanko Marinov - cemballo.